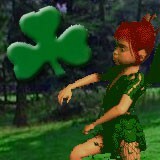 3D Shamrock Fairy 1.0 is screen savers: other software developed by San Diego Screen Savers. Impish red-haired Irish fairy floats and dances among falling shamrocks in a lush green meadow. Celtic music plays in background. A charming gift for your sweetheart on St Patricks Day. Want a soothing nightime scene? Just set the time of day to nightime and a dark shadowy blue hue is cast on everything. Prefer a dusky sunset scene? The sunset setting produces a deep orange hue. Demo contains full set of features. This program is shareware, which means you can download and use 3D Shamrock Fairy 1.0 for free during 30-days trial period. After this period you gonna have to buy 3D Shamrock Fairy 1.0 software for $10.00 or uninstall the program. 3D Shamrock Fairy 1.0 supports English interface languages and works with Windows 98/XP/Vista. Latest 3D Shamrock Fairy 1.0 does not contain any spyware and/or advertise modules, allowing installing it with no worries concerning valuable information loss. Our website has thoroughly tested desktop product 3D Shamrock Fairy 1.0, written the review and uploaded installation file (3001K) to our fast server. Downloading 3D Shamrock Fairy 1.0 will take minute if you use fast ADSL connection. 3D Leprechaun dances to celtic music in an isolated wood with magic mushrooms, falling shamrocks and wood elf house. 3D Easter Eggs of varied size and color float in a spring forest as an Easter bunny hops by. Lush garden surrounds rock-trimmed waterfalls.